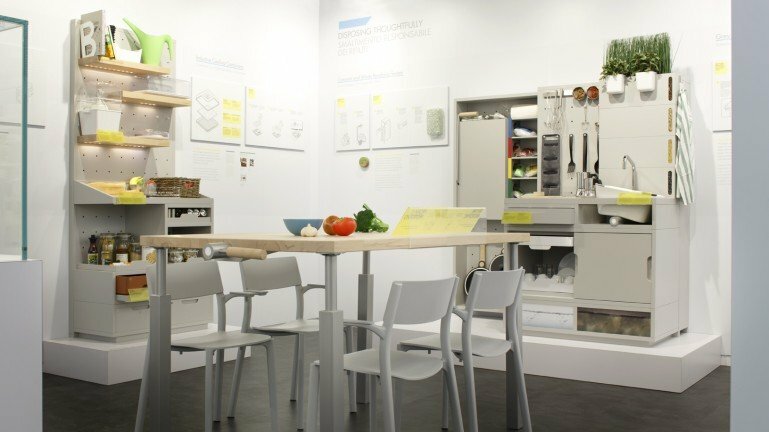 As part of Milan Design Week, Ikea has revealed their Concept Kitchen 2025, created in collaboration with London-based design firm IDEO and students from Sweden’s Lund and Eindhoven universities. 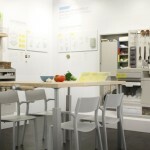 The futuristic kitchen prototype is based on predictions about what the world will be like ten years from now. It assumes we’ll all be living a much greener, reduced lifestyle and technology such as smart tables and drone-delivered groceries will run kitchen operations. It’s a world where where people mostly live in cities in very small flats; where the kitchen is also the living room and work space; where food, especially meat, is scarce; and where recycling is strongly encouraged, even enforced. 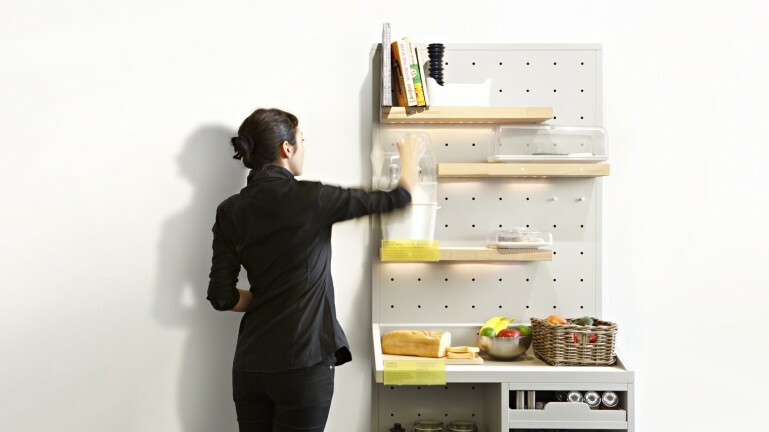 It’s also one where most people work from home, groceries are delivered immediately on demand and where computers are ubiquitous, yet almost invisible. 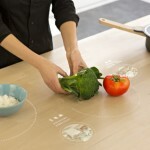 The smart table/cooktop would be the anchor of the kitchen thanks to its responsive surface that operates with induction coils below and a projector above that displays an interactive control center. 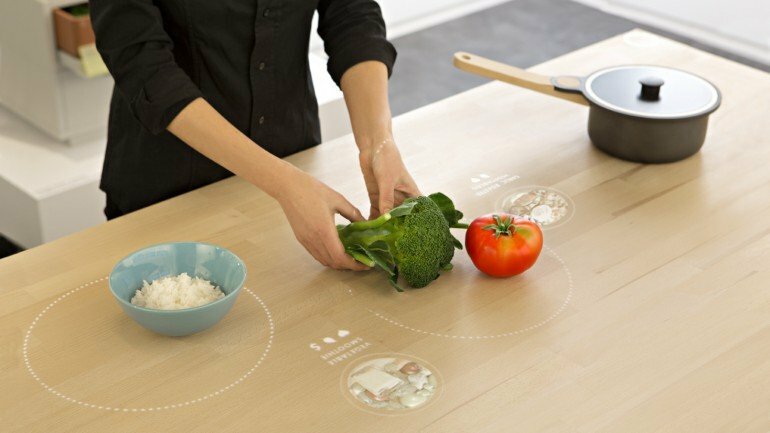 When food is placed on the table the camera registers it and suggests recipes based on a timer you can set for how long you’ll be able to spend cooking. It’ll also offer handy cooking tutorials. 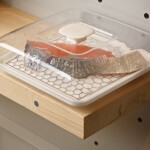 The coils are connected to computer networks, which can heat cookware like a traditional range or do more high-tech duties like charge portable devices. 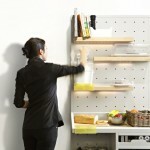 Since the design team predicts that in 2025 no one will make weekly trips to the grocery store, but will instead get small batches of food delivered in mere minutes likely by drone, refrigerators and walls of cabinets will be a thing of the past, replaced with a simple storage system made of open shelves on an adjustable peg board. 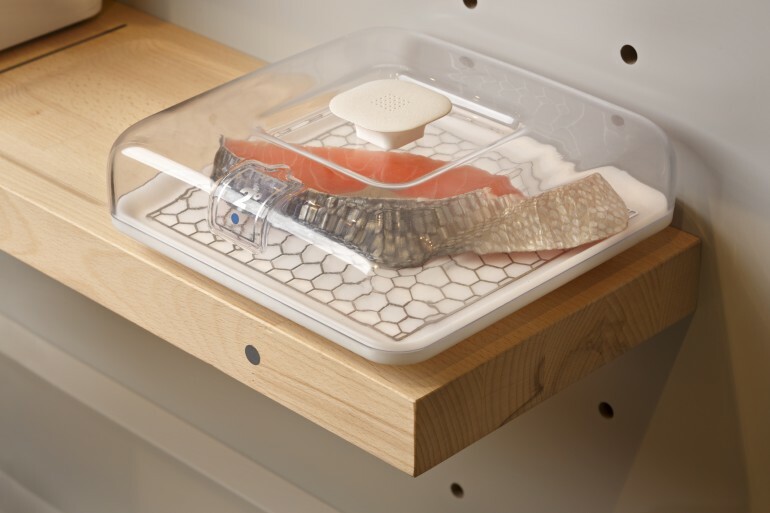 Inside the shelves are sensors and smart induction cooling technology for perishable foods and small, self-refrigerating containers that display the temperature at which they should be stored. There’s also terracotta boxes that provide a naturally cool spot for items like potatoes, carrots, and garlic. For cleanup, forget the traditional trash can. “The Thoughtful Disposal system takes over, with the householder manually sorting recycling from rubbish in a sort of home bottle bank. These are then crushed, vacuum-packed into a bio-polymer tube, and labeled for pick-up after which the householder is either credited or fined, depending on how wasteful the rubbish to recycling balance is,” explains Gizmag. Organic waste will go into a composting system where it will be turned into a dry, odorless puck for pickup by one’s city. To reduce water waste, the sink is tilted left for grey water, which can be reused for things like watering plants, and right for black water, which gets flushed down the sewer. 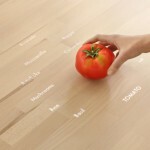 You can explore Concept Kitchen 2025 here.